We had a bit of weather last week which did not deter the majority of the fisherman. The fish didn't mind the extra water evidenced by some great catches! With the lake level up and the DFW stocking 1800 pounds this last week as well as a load of larger 'trophy trout' coming this week we are still fishing great and should be fishing great for the remainder of the fall. This is the time to come and fish with less pressure/people, plenty of hungry fish and fall colors still hanging on. Definitely an optimum time to get at least one more trip in before winter. Sign up for the Morrison Bonus Derby next weekend, October 28-30. 14 trophy trout will be tagged with values from $1000 to $50. The total cash value will be $2,200. Catch of the Week: A full cooler of fillets is on it's way back to Anaheim, CA. Worms were used by the inlet. Trent and Bill Cawthon used Kastmaster and Buoyant lures by the outlet. 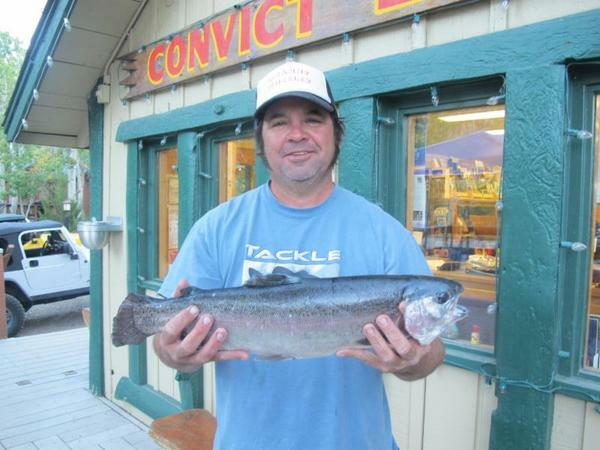 Return customer above, Joawn Menchaca showing off a pretty nice full stringer using the classic "Pistol Pete" lure. Tactics/Bait: The fishing was good either fairly deep with inflated nightcrawlers or fairly shallow with heavier lures in brighter colors. Hot lures were Thomas Boyants in gold or gold/red colors and Kastmasters with red or silver flash. If you plan on fishing with inflated crawlers don't forget a worm inflator and if you have never used a worm threader...get one. Once used you will not know how you ever got a worm on a hook without one (both available in our general store). Derby News: The Ambush at the Lake Fall fishing derby started on September 5th and will run until the end of the 2016 fishing season. Don't miss out on the chance to win $6,000 in Resort prizes! The Morrison Bonus will be on the weekend of October 28-30. $2,200 in cash prizes. This week we are looking at some rain showers Monday and Thursday with slightly cloudy weather in-between, don't worry the fish do not care. I have have hade some of my best days of fishing in some of the worst conditions. Always be prepared. Night time temps range from 25-35 with daytime temps from 49-62. : 7-Day Forecast Convict Lake. Sunrise - Sunset: Sunrise this week 7:11am - 7:17am and Sunset 6:10pm - 6:03pm. 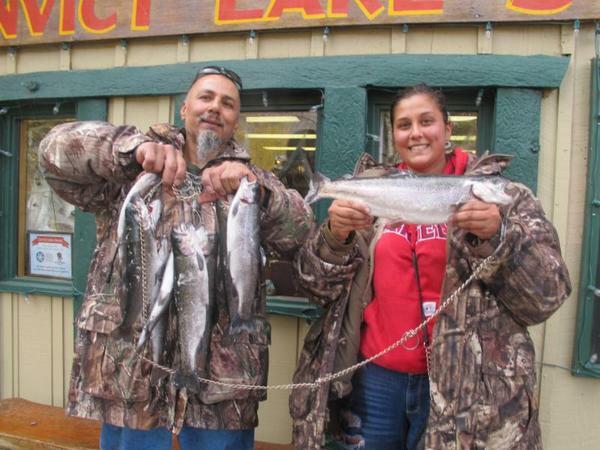 Stocking: The resort is scheduled to stock trophy trout on October 27th. The DFW stocked this past week.